Can they stay healthy? From left, Harner, Simmons, Clark, Davis, Elsawi. 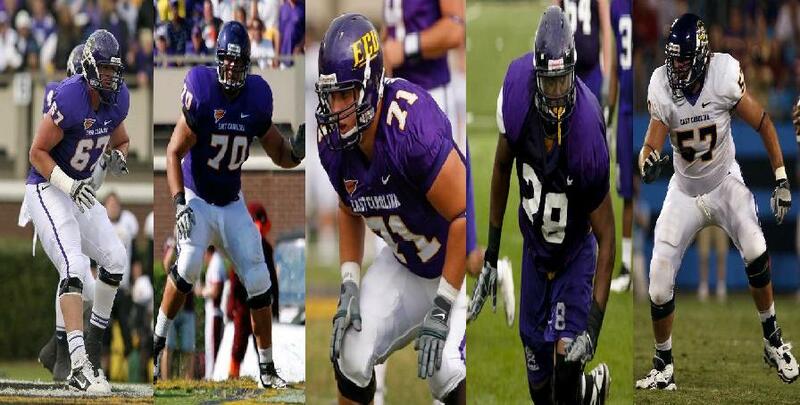 There are many things about the ECU offensive line that cannot be denied in 2011, they are statistical. Our running game was anemic, our sack rate was among the worst in the nation, and we rarely were able to field the same OL in back-to-back games. Love to hear yours, too. The number 1 offensive line lasted all of 3 starts before the injuries set in. Now, those three starts weren’t gangbusters, but we were competitive, letting a lead slip away from us to lose to USC, getting edged by Virginia Tech, and then beating UAB. It is hard to say if we would have been great if the starting five could have played together longer, but logic says we would have been better than what we ended up with. After the 3rd game of the season, the Pirates did not start the same five linemen again and, in fact, moved guys around seemingly every game. The team dealt, again, with a shortage of centers to work with, and by the time it was all said and done, the patchwork line had seen a good dozen linemen hit the field in various combinations. The good news, all lies in what it means for this season: More linemen, more experience, and a better handle on who should be where. The bad news, this group – sans right guard Will Simmons and left guard Jordan Davis – has not shown it can make it through the rigors of a full season and, there is a depth concern at tackle, specifically, left tackle, and at center, the latter an issue that has been with the program since this staff’s arrival, exacerbated by the departure from the program of promising young center Mack Helms. Still, you have to like that, if healthy, we should have a solid group of experienced linemen buffered a bit with a couple young guys who are ahead of schedule and chomping at the bit to earn slot themselves. Spring will offer some of these guys opportunities to get and stay on the depth chart before incoming players join in the battle, so there is a lot to do and learn about this group this spring. The big questions? Will we be able to find security at the center position? Will we find a top flight left tackle? Will we be able to run the football…at all? So who are the men who will battle for the trenches? There are a lot of young men to talk about and I will break them down into positions, noting where I think they will end up. Josh Clark: When Clark came into the program under the Skip Holtz regime, I found it odd that he was moved off of center and out to tackle given that he was a pure center in high school and was a good one. He would have probably seen the field sooner had he stayed at center, but worked hard at tackle and broke through last spring, setting himself up to get PT at the tackle position. Attrition at the center position – again in 2011 – was a moment of serendipity for Clark individually and for the program collectively. Who knows, had Polochak stayed healthy all season if Clark would have been rediscovered as a center. Now, the senior is not only a very good center, but he has built himself up into a massive 300 pounder who can make all the offensive line calls and is still quick off the snap. Now, the trick is, can he stay healthy and break what has been a horrendous run at this position for Coach Ruff and his staff. I expect Clark to be a noticeable upgrade at this position in 2012. Prediction: Clark exits camp as the clear cut No. 1 at center. Taylor Hudson: Hudson is a very important lineman going into 2012, mainly because he can play all the interior positions and is a talented athlete. Riley has expressed that Hudson needs to “put it all together” this camp to lock down a serious role. I think this is why they are camping him at center. With the guard position with some reasonable depth, center has been circled as a great need and Riley certainly wants to hedge his bets here by having more than a few options in the middle. Hudson is potentially a very good center and I expect him to put it all together, as Riley is hoping, and line himself up to be a primary reserve and getting plenty of snaps in 2012. Prediction: Hudson will be the clear cut No. 2 at center or an “OR” No. 2 as center as well as a No. 2 at the guard position(s), pending the depth chart battles at that position. C.J. 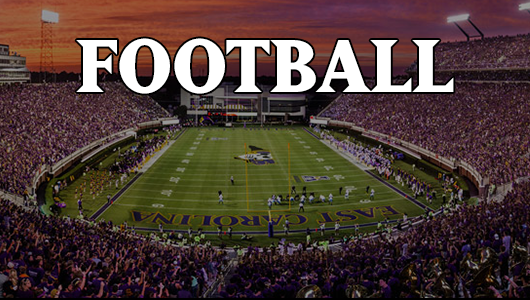 Struyk: I noted a year ago when Struyk was signed as an invited walk-on that he might very well be one of the most important walk-ons in a while at ECU. Now, the FR-RS will actually be competing for a depth chart position at center. He is freakishly strong for a young lineman and knows the position extremely well. He got snaps in camp a year ago, which will help him this time around. And, he has heart…which will be what may make the difference for him in camp. Prediction: Struyk finishes camp as an “OR” No. 2 or a clear cut No. 3 and also be in the battle for the deep snapper job. Jimmy Booth: The former nose tackle who was converted in the off-season to offensive line will cut his teeth first at center. This is mostly because there is concern over depth at the position and also because he is built like and strong like you need a center to be. No doubt, he can move people off the ball, the question is, can he learn the position at the level needed? I expect that Booth will work in at several positions as he learns the ropes this spring. Prediction: The line-up at center, I believe is in the best shape it has been since Ruff’s arrival. Not sure if there will be room for Booth at the position and expect he will not be in the 3-deep at end of camp, unless Struyk is so good, that Hudson moves back over to guard for camp. Jordan Davis: Davis started out the season in 2011 as the left tackle, primarily because of his athleticism. Once Steven Baker emerged as ready to play that position, Davis was moved into the interior to the left guard position – his natural position – and thrived, giving the Pirates, potentially one of the best guard combination in the league. At 6-3 and pushing 300 pounds with exceptional agility, Riley believes that in Davis, we have one of the most physically gifted guards in Conference USA. Davis got a heavy dose of experience a year ago and should be a monster in camp and beyond this season. Prediction: Davis will be the clear cut No. 1 at left guard coming out of spring. Will Simmons: Of all of the linemen going into last season – save Grant Harner at right tackle – Simmons was expected to be very good and he did not disappoint. Not only was the only lineman to go the entire season in the spot he started at, he did so with a consistency that was uncanny. Big, nasty, aggressive…he has all the qualities you want in an interior lineman. He should compete for all league honors this year and with Clark and Davis comprises the true strength of the Pirates OL heading into this camp. Riley has put Simmons up to the OLs as the model for where he would like the full unit to be. Now with a year of experience under his belt, expect leadership qualities to begin to emerge in camp. Prediction: Simmons will exit camp as the clear cut No. 1 at right guard. Drew Gentry: Gentry started to demonstrate what he could do late in the season a year ago, seeing action in the final 7 games and grabbing his first start in the UTEP game, where he performed well. That experience is critical for Gentry who is expected to be a integral member of the unit in 2012. he can play either guard position, though the hope is he can lock down the No. 2 job behind Simmons. Camp is a chance for Gentry to see how well he performs having put in a good effort at Camp Connors in the off-season. Gentry got a good taste of game time a year ago so I suspect we will get his best effort in the spring. Prediction: Gentry locks down the No. 2 spot on the depth chart at right guard and perhaps gets an “OR” at left guard as well. Robert Jones: For Jones, this is last go round for spring and now that he has had a year to absorb the position after switching from the Defensive Line in 2010, he should be able to challenge. ECU has a great track record of guys who have moved from defensive line to OL – with two currently in the NFL in Guy Whimper and Willie Smith. The move wasn’t one made for no reason, so expect for Jones to push hard for a depth chart position at guard. He is working in at right guard for now, but is also a guy who could probably slot on either side. He is not as massive as some of his competition and didn’t see any playing time in 2011, but he should bring that defensive lineman mentality and a year’s worth of knowledge to the challenge. Prediction: Jones finds a way to stick on the depth chart as the clear No. 3 at right guard. Stewart Hinson: Big…that is one thing that cannot be denied about Hinson who is working in at guard for the spring. At 6-7 and 300+ pounds, he has the measurables that Riley defined as ideal for the system and represents the first of these long, big guys to find himself in the interior. Riley didn’t discuss Hinson much when I asked him about young guys who are ready, but with him being put at left guard for camp, it does indicate that he has the physical tools. The question is if he is physical and strong enough to be effective. Hinson needs to demonstrate this this time through so he can get on the DC and begin prepping for regular action. What effect Camp Connors had on Hinson will determine what he accomplishes in camp. Prediction: Hinson will exit camp as an “OR” No. 2, maybe even a clear cut No. 2 at left guard. Jonathan Powers: A walk-on who was able to participant in camp last spring as a true freshman, Powers should benefit greatly from the experience he gathered at the last camp and over the course of the 2011 season. Not overly massive at 6-2 and under 300 pounds, Powers finds himself slotted in the camp battles at left guard, which should speak to his agility and athleticism. In high school, in Wimington, NC, he was an all-area track peformer, which should give some insight additionally into his abilities that might transfer to the line. He is a bit of a wild-card in this camp but clearly will get some reps and hence a chance to show what a year in the system and with Camp Connors can do. Grant Harner: Though he will be limited in what he does in spring camp, Harner is a critical cog in the 2012 OL. He sustained an injury last year that was characterized as “pretty bad” by Riley and played hurt for a lot of the season, but never could play his top level. He is a veteran who has started for 2 years now and is taking a measured path back to full action because of how critical he is in the game-plan, particularly while the team looks to solidify depth at tackle. Prediction: Though he may not be listed on the depth chart after spring if he does not fully participate, he is indeed the clear cut No. 1 at right tackle. Adhem Elsawi: Elsawi was a wonderful surprise in 2011, having transferred in from Campbell the year before. He started the first 5 games at left guard before an injury forced him out. He returned to play right (thanks for the catch ultraviolet) tackle and performed well. Elsawi comes into camp under a great deal of pressure to lock down the left tackle position where there is almost no depth. He can also play right tackle, which helps. He is big and agile and experienced and hopefully can parlay that into a solid hold on the left tackle slot, which would allow the focus to be on depth hitting into 2012. Prediction: Elsawi will be the clear cut No. 1 at left tackle when camp ends. Chaz Lowery: Riley is very excited about the redshirt frosh he has working at Right Tackle in camp. Lowery is a very smart athlete and capable of working in at that position. He has had a year of Camp Connors and by all accounts is ready. It is a dream come true for Lowery in this camp as he will get monster repetitions at right tackle as Harner is limited to conditioning work. Lowery will need it because he has to be ready this season for significant playing time. Prediction: While Lowery may list at No. 1 after spring camp at right tackle, effectively, he will be locking down the clear No. 2 slot on the depth chart behind Harner, the expected starter. Isaac Harris: Another of Riley’s prototypical young tackles, the 6-7 former prep basketball standout seems like a perfect fit for the left tackle position, which is where he will work in camp. He has been through Camp Connors but is still perhaps a little light yet for the role, but his athleticism should off-set that to some degree. His father was a standout offensive lineman at USC, so he has the genetics to be very good and Riley has said that he is ahead of schedule and ready to get on the field. This is a big opportunity for Harris and even bigger in importance for the team. If Harris performs well enough to rate discussion in the fall at left tackle, that is a great sign that depth is emerging. Prediction: Harris will be the clear No. 2 at left tackle out of camp. Tre Robertson: Coming off of a redshirt year, Robertson gets his first spring action and will do so with hopes that he can solidify himself in the conversation at one of the tackle spots, most likely. He was a well-regarded pick-up a year ago during recruiting and he has the type of size that you can work with at 6-5 and 300+ pounds. He has to establish himself in a position this spring so he begin tracking in on the depth chart. Prediction: Robertson will start to track in on a primary position in the spring and could possibly slot at a No. 3 at one of the tackle positions, but may also be a year away from really being part of the conversation. Prediction: Mann’s depth chart positioning depends on where we have severe depth issues, but it is not likely he will make the depth chart in spring. Conclusion: All the running backs, QBs, and receivers in the world won’t go very far without the offensive line getting healthy, in sync, and developing depth. In this crop of OLs, there appears to be a solid pool of experienced players to establish a competitive starting five and potentially a very, very good interior group. However, there is no getting around the depth concerns at tackle and center, the latter, on paper, being in a little better shape than the former. There will be some help coming in the fall, but system knowledge is one of the primary keys in being effective in this offense, so at least for now, don’t bank on anyone other than the guys we have in camp today. The success of this unit comes down to how ready the young guys really are. If Lowery, Harris, Hinson, Struyk, and others are strong enough and know the system well enough to be ready reserves should attrition set in again, we have a chance to have a good unit. If not, we are literally one injury away from collapse. 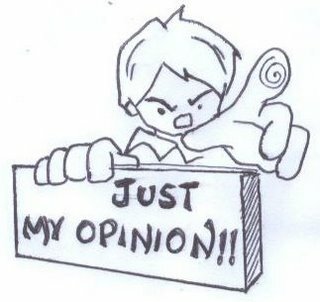 Well…those are my thoughts…please chime in.